Last week, I received a box of Sébastien Bouillet macarons from my fabulous dental hygienist, Martin, who returned from a trip to Japan. He and I share a love of food which causes my biannual dental cleanings to be somewhat lengthy due to conversations interrupted by polishing, flossing, and fluoride. 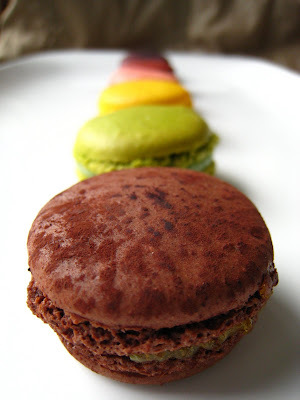 The macarons were a complete surprise and an unexpected act of deliciousness. 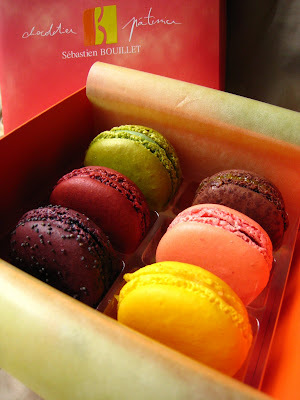 The six flavours were chocolat orange, pistache, citron, fraise, framboise, and myrtille. All except for pistache and citron were jam-filled and most were very sweet and incredibly soft. I cannot wait to return to France, and Lyon in particular, where Sébastien Bouillet is based, in order to taste his other macarons, including flavours named Barbe à Papa rose and pop-corn. In fact, heading to Tokyo may be an equally exciting pastry destination! Posted by Charmaine at 4:18 p.m.